The blanket is knitted in 4 ply, and measures approximately 85cm x 100cm. I used Shepherd Merino Baby 4 Ply Wool, but you can use any good brand of baby wool. It is knitted on 3.75mm single pointed knitted needles at a tension of 21 stitches and 44 rows in a 10cm square. You will also need a knitter's needle for sewing in the ends and for the adventurous among you an 80cm long 3.75mm circular knitting needle to knit a band around the edge of the blanket. Knit all rows. Continue until the blanket measures 100 cm (approximately 440 rows). This blanket was made using four colours. I used 5 x 50 gram balls of each colour to complete the blanket, if you want to use more or less colours for your blanket, you will need to adjust the quantity required. Commencing with the 1st colour knit four rows. Change to the 2nd colour and knit another four rows. Change to the 3rd colour and knit another four rows. Change to the 4th colour and knit another four rows. Repeat the stripe pattern as set until the blanket measures 100 cm finishing with four rows of the 1st colour (approximately 440 rows). With your knitters needle sew all of the loose ends of yarn into the edge of your blanket and trim. This band will increase the size of the blanket to 85cm x 110cm. 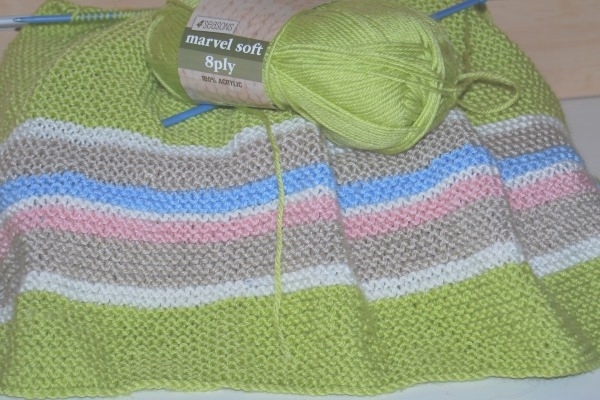 Using the 1st colour pick up and knit 195 stitches along the top of your blanket. 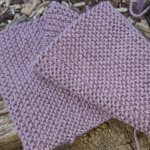 Pick up a stitch on the corner and then work your way down the side of the blanket picking up and knitting one stitch for every two rows adding an extra stitch on the corner. Pick up and knit 195 stitches along the bottom of the blanket, adding 1 stitch on the corner as before. Work your way up the other side of the blanket adding a stitch in the top corner. Turn the work and knit one complete row. Turn the work. 2nd row: Inc in 1st st, *knit to 1 stitch before the corner stitch, inc in next st, k1, inc in next st, repeat from * twice more, knit to the last 2 stitches, inc in next st, k1. Repeat these two rows until the band measures 5 cm ending with a 2nd row. Using your knitter's needle sew up the corner seam of your knitted band. Change to the 1st colour and knit another four rows. Change to the 3th colour and knit another four rows.